Rough luxe is the one home decor trend everyone’s been going on about for the last few years – and it’s not ready to stop anytime soon. You may not know it yet but its specificities are immediately recognisable, such as skillfully scraped wallpaper in the rooms: just enough to give it a distressed look and let the walls tell a story. 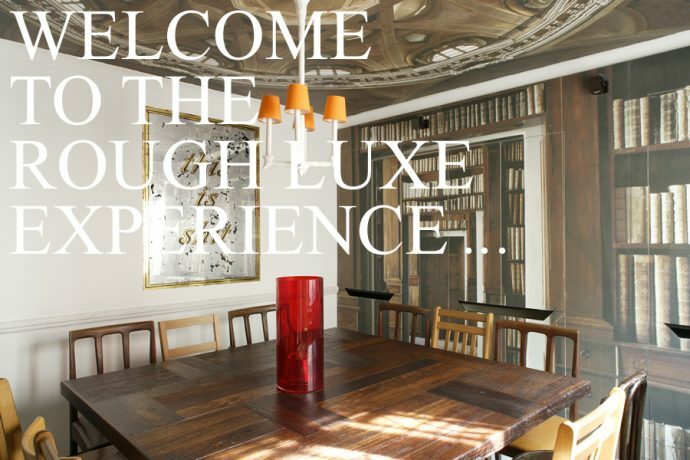 In essence, rough luxe is all about bringing a sort of grunge boheme, shabby chic vibe to your home interior. Rough luxe first came about in England in 2008. According to some, reknown designer Rabih Hage initiated the trend as he was working on a 4 stars boutique hotel overhaul in Campden, called Rough Luxe (or “poorgeois” for the more cynical among us). Hage might have made Rough Luxe become a thing, but the trend has certainly been about for longer: in the 1990’s, grunge already made a point of mixing luxe and distressed elements. In any case, shabby chic has become the norm for a lot of boutique hotels around the country, from Fife to Dorset. It’s all about creating a distressed appearance, as if the room hadn’t been redone for a while, but balance is important if you don’t want your home to look gloomy and unwelcoming and there are a few good rules to follow imperatively. Furniture should look retro but not like it’s been taken out of the dumpster. Why is rough luxe an insider trend? The irony of rough luxe is that despite using reclaimed materials, it can actually be quite hard to master and source the right pieces for your home. Most people that are after this particular vibe for their interior often seek the help of a professional designer which can also make it quite expensive – the home design equivalent of those $ 500 ripped pair of jeans. Nevertheless, with a bit of creativity and the right addresses, it’s a style that’s still achievable. Look out for specialty stores that now sell trompe l’oeil rough luxe patterns and decor: the result is uncanny and some of them even include windows! Rough luxe is mostly known for its scraped wallpaper look, but you could very well choose to highlight a nicely distressed tiled floors by redoing the walls and leaving the tiles in their original condition. Old leather sofas and wooden furniture with a chippy patina finish will be perfect to finish up the rough luxe look. Look out for them in flea markets, garage sale and second-hand stores in your local area!